In 1995, Toy Story ushered in a new era of animation, as the computer generated movie revolution was born. This innovative medium ushered in a fresh take on animation and soon CG animated movies will filling cinemas on a regular basis. One would assume that this technological innovation would have given the filmmakers involved newfound freedom to explore new worlds and let their imaginations run wild. And yet, this new sub-genre has proven to be one of the most redundant and auto-cannibalizing forms of entertainment out there today. Toy Story set the precedent of everyday objects who come to life and provide a plot in which two (or more) opposite characters are ripped from their everyday lives and must have an adventure. This formula has been the backbone of many Pixar films and it has spread to other companies, as evidenced by The Secret Life of Pets. Max (voiced by Louis C.K.) is a little dog who has a happy life. He lives in an apartment in New York with his owner, Katie (voiced by Ellie Kemper). During the day, when Katie is gone, Max checks in on his friends -- dogs Gidget (voiced by Jenny Slate), Mel (voiced by Bobby Moynihan), Buddy (voiced by Hannibal Burress), and cat Chloe (voiced by Lake Bell). These animals miss their humans, but they like doing their own thing. But, Max's perfect life is interrupted when Katie brings home Duke (voiced by Eric Stonestreet), a massive dog. Max resents this intruder and makes some attempts to frame Duke for wrecking the apartment. While on a walk, this pair finds themselves loose in the city and pursued by animal control. Max and Duke learn that they must work together in order to survive a violent gang and the city. Regular visitors to this site know that I praise originality. That's not going to happen here. Prepare yourself for quite the opposite. Again, Toy Story set the standard for modern CG animation. But, that doesn't mean that one has to emulate it...or outright copy it. It doesn't take an in-depth examination to see that The Secret Life of Pets is nearly identical to Toy Story, simply substituting animals for toys. A non-human character who is very content with their human suddenly has their world turned upside down by a new non-human who is their exact opposite. The content character reveals a dark-side by trying to get the new character thrown out. This plan backfires and the two find themselves lost in a strange world where they must fend for themselves and fight to get back home. In order to achieve this goal, they must set aside their differences and learn that they are more similar than they ever imagined. So, take Woody and Buzz and insert Max and Duke and take it from there. Along with the ancillary characters, in which Gidget replaces Bo-Peep, we get an evil gang that is not unlike the misfit toys in Toy Story. It's as if someone created Toy Story Mad-Libs and the writers of The Secret Life of Pets just filled in the blanks, while also inserting the evil bird from Stuart Little 2. So, does The Secret Life of Pets have anything original going for it? Not really. Outside of the familiar aspects, there isn't much to offer either. There are a few funny lines and some of the characters have humorous mannerisms, but comedy isn't the film's strong suit. The action scene involving a fight with a gang of cats shows some creativity, but there's no suspense or intrigue. The movie simply moves from scene-to-scene having the characters move from one uninspired scene to another. The only time that things veer from the map are when the animal liberation gang arrives, as Kevin Hart brings a lot to his role as Snowball the rabbit and the introduction of a giant snake nearly feels out of place here. 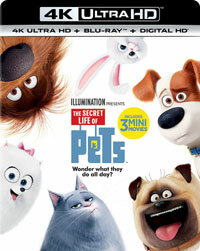 The Secret Life of Pets comes from Chris Renaud and Illumination Entertainment, the creators of Despicable Me. That movie brought a very original and decidedly skewed voice to the world of animation and really raised the bar on how weird a family movie could be. So, it was surprising to see the giant step backwards that the group took with this movie. While watching The Secret Life of Pets, I couldn't help but wonder why someone didn't step in and tell the writers that the movie was incredibly derivative. But, when a movie makes over $350 million at the box office, who is going to tell the filmmakers that they are wrong? Most modern animated films, no matter how well-known, have some little quirk to them. Hopefully, the vanilla nature of The Secret Life of Pets is simply a fluke and not a sign of things to come. The Secret Life of Pets is not a good boy on Blu-ray Disc courtesy of Universal Studios Home Entertainment. The film has been letterboxed at 1.85:1 and the Disc contains an AVC 1080p HD transfer which runs at an average of 32 Mbps. The image is very sharp and clear, showing no defects from the source materials and no grain. The colors look very good and the image is never overly dark or bright. The level of detail is impressive and the depth works quite well. The Disc carries a Dolby Atmos 7.1 audio track which runs at 48 kHz and an average of 6.0 Mbps. The track provides clear dialogue and sound effects. This is an active track which offers quality stereo and surround sound effects. During the action sequences, we are treated to detailed audio from the rear channels, and stereo effects which highlight sounds coming from off-screen. This set also includes a 4K Ultra HD Disc where the film has once again been letterboxed at 1.85:1 and the Disc contains a 2160p transfer. Thus far, I've found 4K releases to be very hit or miss, but this is one which is definitely better than the Blu-ray Disc. The clarity of the picture is simply amazing and the colors are incredibly bright and true. The image shows a great amount of depth, even in this 2D version, and the level of detail is fantastic, as the image is never soft and the edges don't blur. The picture is truly immersive and shows off what 4K can do. The 4K Ultra HD Disc offers a Dolby True HD 7.1 track which provides audio very similar to that found on the Blu-ray Disc. The Secret Life of Pets Blu-ray Disc contains a bowlful of extras. We begin with three "Mini-Movies" -- "Norman TV" (4 minutes), "Weenie" (4 minutes), "Mower Minions" (4 minutes) (which, yes, features The Minions). This is followed by "The Making of The Mini-Movies" (7 minutes) which takes us into the animation studio and allows the animators to discuss their work. "The Humans that Brought You Pets" (9 minutes) offers individual interviews with five members of the team behind the film. We go inside the recording studio to see the voice actors at work in "Animals Can Talk: Meet the Actors" (4 minutes). "All About the Pets" (6 minutes) has Kevin Hart and Eric Stonestreet meeting some real-life animals. Stonestreet returns in "Hairstylist to the Dogs" (4 minutes), where we get to see a dog being groomed. We return to the animation studio in "How to Make an Animated Film" (4 minutes), showing us the team at work and some of the crude animation. "Anatomy of a Scene" (5 minutes) allows us to see the intricacies of the animation and the various layers which go into it. "The Best of Snowball" (1 minute) is simply a reel of quotes from the rabbit. We get the MUSIC VIDEO for "Lovely Day", complete with lyrics. "Hot Dog Sing Along" (1 minute) brings back the weirdest scene from the movie. "Brian the Minion on Pets" is a three-part piece in which The Minions react to the movie.